OK…Christmas has already come and gone, I know, but it’s still technically the holiday season, and the title of this episode is the title of a Christmas CD project I recently designed. That’s the project I showcase in this episode, in which I demonstrate a holiday grab bag of InDesign goodies including: starting a document on a left-hand page, using the Slug area and Text Variables, placing InDesign documents inside of other InDesign documents, using frames to crop and manage vector shapes, inserting Column Breaks and other special break characters, and setting up looping Nested Styles. Watch the episode here (23:25 | 41.6MB), or you can subscribe via iTunes. 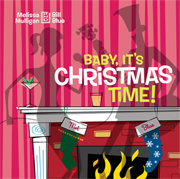 Listen to or purchase “Baby, It’s Christmas Time!” at CDBaby.com. Download “Baby, It’s Christmas Time!” from iTunes. When I set up the printer’s spreads for the CD booklet, I could also have just changed the page number of the first page in the document to 4, which would have automatically moved it to a left-hand position. Any even page number will do this. However, the advantage to using my method would be better in other cases, specifically for spreads that contain more than two pages. If this CD had been included 6-page booklet, I could not have set up the three-page spreads if the shuffling options were on. Since a six-pager would require different page numbering (5,6,1 for the outside spread and 2,3,4 for the inside spread), I wouldn’t be able to rely on the simpler page numbering change to position the pages properly, either. Also, it wasn’t necessary for me to have all the pages selected when I turned Allow Pages to Shuffle off, but since my next step was to turn shuffling off for each spread (essentially “locking” them together), I just selected everything first for both operations. It was pointed out to me by Dave Saunders, a friend and InDesign scripting genius, that rather than use the column break character for the musician credits, I could have built a “Start in Next Column” attribute into the Artist Name paragraph style. This is actually a much more efficient method than I used. However, at least I was able to point out to everyone the different types of break characters available in InDesign. Howzit Michael (as we tend to say in South Africa when we don’t feel like saying Heyta). I discovered your site during a period when a paid site to which I subscribed had a week of difficulty. theindesigner has been excellent and I have learnt a great deal. Thank you. Regarding the book: Will it be available as a .pdf download and at what cost? I find computer books in South Africa very expensive and frankly prefer to be able to search queries I have on screen.